At the age of 22, Tupac Shakur was caught in a maelstrom. He had been embroiled in legal issues for years, having previously been imprisoned for assault, and investigated in connection with a non-fatal shooting involving off-duty police officers. Tragically, he was also involved in a wrongful death suit when a 6 year old child was killed when a member of his entourage attempted to pick up a pistol registered to Shakur and accidentally discharged the weapon. In 1994 the rapper was robbed and shot five times in the Quad Recording Studios building in Manhattan; following that shooting, Shakur checked himself out of hospital against his doctor’s orders three hours after surgery. He would later blame the shooting on former associate and fellow rapper The Notorious B.I.G. and Bad Boy Records boss Sean “Puff Daddy” Combs. These were notes from an America that was seldom reported in the mainstream press, and seldom acknowledged. The Rodney King riots had recently seen Los Angeles erupt with a vitriolic violence that had lain dormant beneath the surface, waiting for a catalyst; on Me Against the World, Shakur experiences a similar moment of personal eruption, not that of violence but of regret. He consciously unearths the demons that lay scattered in his mind, hoping that through exposition they may be defeated. Pained, afraid, and searching for answers, he writes everything down and sends it to us as an open letter. 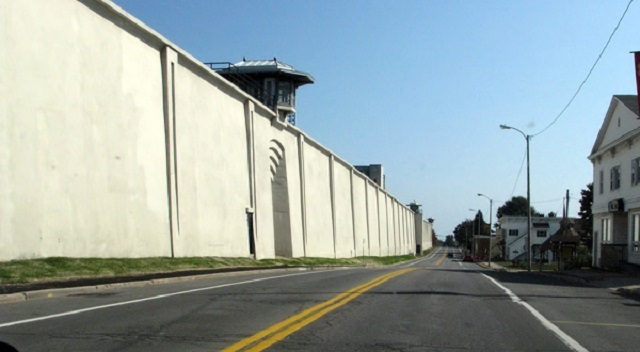 Clinton Correctional Facility. C.C. Image: Bubby1124 on Wikimedia Commons. “More bodies being buried/ I’m losing my homies in a hurry/ They’re relocating to the cemetery/ Got me worried, stressing, my vision’s blurry/ The question is will I live?/ No one in the world loves me/ I’m headed for danger, don’t trust strangers/ Put one in the chamber whenever I’m feeling this anger/ Don’t wanna make excuses, cause this is how it is, what’s the use?/ Unless we’re shooting no one notices the youth,” Shakur raps on the title track. The bassy hoarseness of his voice is strained, as though he is trying in vain to internalise difficult emotions, overcome as he stands in the mic booth. This was the first time the world had truly been exposed to Tupac Shakur as he was before his tough showboating days: Tupac, the baby who was born only a month after his mother Afeni (a former crackhead) was acquitted of more than 150 charges of “Conspiracy against the United States government and New York landmarks.” Tupac, whose parents, godfather, and stepfather were all high-ranking Black Panthers (his uncle spent four years of the ’80s on the FBI’s Most Wanted Fugitives list). Tupac, who escaped his violent, tumultuous upbringing to enrol at Baltimore School for the Arts to study acting, poetry, jazz, and ballet, performing Shakespeare and the role of the Mouse King in The Nutcracker. Tupac, who studied poetry and composed heartfelt, tender odes like The Rose That Grew from Concrete. Tupac, who was remembered by all who knew him as magnetically popular, funny, kind, and talented; teachers described him as an intensely charismatic who relished entertaining those around him, and making people laugh. The beats on Me Against the World are of-the-time, with pounding kick drums, vinyl scratches, soulful studio croonings from a host of guest vocal soloists, tasteful Fender Rhodes keyboard licks, and flourishes of guitar here and there. None of the songs are carried by their beat, as some of the great rap songs have been, but there is no need for that dynamic here when Shakur is so lyrically on-form. The instrumentals are uniformly dark, slow, streets-inspired canvases for Shakur to paint his lyrical pictures on top; to listen to Me Against the World in order to hear big hooks, club hits, or massive beats is to make a critical error. These are street poems recorded by a young renegade, and the soundtrack is fitting. Me Against the World is an outstanding record: it lets light in on dark thoughts, trauma, pain, and sorrow, and in doing so it is a lasting monument to the storytelling prowess and undying charisma of Tupac Shakur. He was brutally murdered just over a year after the album’s release, by individuals who have never been apprehended, and we will never know what sort of artist Shakur may one day have become. Yet Me Against the World remains the most defining testament we have. A testament to a musician and writer who was always more than what he seemed to most; beneath the tattoos, the tough demeanour, the felonious affiliates, and the boastful arrogance of his younger days, there was a poet of immense insight, passion, and intelligence. There is a beautiful irony that, in airing his demons on these songs and in titling this record in such a manner, Shakur found in the year before his death more recognition and acceptance than ever before; he found that there was an entire subculture of America who could relate to his pain. These vulnerable lamentations will endure forever, and Tupac Shakur will continue to be remembered as the immortal prophetic poet of rap music. The notation for "A Love Supreme". Public domain image: Wikimedia Commons. A sprawling, four-part odyssey that sees hard bop collide with modal and free jazz; a “musical recitation of prayer by horn”; a legendary quartet at the height of their powers recording an everlasting classic in one session; a visionary masterpiece that has been canonised as one of the great records of its time. A Love Supreme was released fifty years ago, and yet John Coltrane’s classic spiritual work has lost none of its potency; sizzling energy, sublime reflection, and introspective thematics collide on every bar, and the results are unforgettable. C.C. Image: Hugo van Gelderen on Wikimedia Commons. A Love Supreme was the ultimate expression of Coltrane’s deep spiritual searching. Including a mantra and a wordless recitation of an original devotional poem, A Love Supreme deals thematically with repentance, purity, and exaltation. Musically, Coltrane strayed beyond his hard bop roots, and embraced the emergent fields of modal jazz as popularised by his collaborator and friend Miles Davis, and free jazz as first explored by Ornette Coleman on his seminal 1959 record The Shape of Jazz to Come. The results are stunning; dark, beautiful, and at times chaotic, A Love Supreme was a record years ahead of its time. Recruiting Elvin Jones on percussion, Jimmy Garrison on bass, and McCoy Tyner on piano, Coltrane fashioned what would later be dubbed his “Classic Quartet”. Every storied musician was in top-form here: Jones’ visionary use of polyrhythm and legato phrasing creates a constantly-evolving percussive chaos that underpins much of the music, while Garrison’s bouncy, walking bass takes simple motifs and meditates on them during the extended passages, constantly rephrasing and adapting to the other instrumentalists, while Tyner employs his distinctive, intense quartal and quintal chord voicings that rapidly ascend and descend the keys, perfectly complementing Coltrane’s similarly-confrontational style. McCoy Tyner. C.C. Image: Roland Godefroy on Flickr. Tyner - one of the most influential jazz pianists of the 20th century - employs decidedly ambiguous chord voicings, sometimes omitting the chord tone itself, and thereby creating an unresolved sense of slight unease that Coltrane as soloist flies in to fill. The saxophonist’s flurries of notes are wild, passionate screams; all but discarding formal ideas of pedal point and ostinato harmony, there is a distinctive Coleman-esque confidence as Coltrane dives headfirst into each run. There are soulful wailings, experimental flourishes, staccato improvisations, and extended variations on the repetitive, simple four note motif that loosely ties each of the four parts together. Coltrane was a master instrumentalist, who famously dedicated up to sixteen hours of each day to careful study and practice of his craft. By exploring the concept of reharmonisation - changing the nature of a melody by altering its underlying harmonics - amongst many other groundbreaking techniques, and by constantly altering chord structure and harmonic content in subtle, ingenious ways, A Love Supreme was inspired work. Elvin Jones. C.C. Image: Tom Marcello on Wikimedia Commons. The following piece, Resolution opens with a propulsive bassline comprised of decisive triplets and a short, sharp solo from Coltrane that is heavy with chromatic notes. He disappears in favour of Tyner’s rapid, dizzying improvisations; the pianist employs syncopated rhythmic techniques and unique melodic phrasing, with a more forceful bass hand than is commonly seen, and a deft, quick-fingered touch on the higher notes. Tyner closes his solo with a series of wild, adventurous chords, spiralling out of control before Coltrane returns with more flurries of harsh chromatic notes, before harking back to the simple phrase with which he opened the track. Resolution is powerfully emotive; it calls to mind the struggles of Coltrane’s day - racial discrimination and empowerment, drug abuse, political upheaval, war, and crime - and yet, as with all four pieces of A Love Supreme, it seems to beg us to let it belong to us. Listen to this music through headphones as you walk through any city in the world, and it will open your eyes; this chaos is the chaos of human endeavour, this question is the question on humankind’s lips, this beauty is the beauty of the human spirit. Jimmy Garrison. C.C. Image: Ira Lax. Third act Pursuance opens with a frenetic, busy solo by Jones, exploring rapidly oscillating fills up and down the drum kit with sparse splashes on the cymbals, before the band join him abruptly. Coltrane introduces a short motif, before it is again snatched by Tyner and spun into a frantic solo, his right hand exploring arpeggios that dance in and out of time with the beat as his purposeful left hits sharp, staccato chords. Coltrane returns with his most experimental solo of the entire suite; jarring bass notes and freewheeling chromatic exploration throughout the upper register, atop a relentless rhythmic foundation that rolls on and on, devolving into a manic fill by Jones before the storm passes and we are once again left with only Garrison’s bouncing, meandering bass, as he solos for the piece’s final two and a half minutes. On this record we have one of the greatest jazz musicians of all time working in concert with the finest accompanists he ever had, and yet A Love Supreme is more than a showpiece for remarkable ability. It is a spiritual awakening; Coltrane’s purest, most honest outpouring of his foundational yearning for understanding in a rapidly changing, complex world. A troubled soul who yet was driven beyond belief towards greatness and towards personal discovery, John Coltrane is an enigma who communicated best through sound alone, and who truly believed in the raw power of music. He understood the ability of music to reach into our souls and connect with us on a spiritual level, to touch us and leave imprints that may never be erased. A Love Supreme looms large in the musical landscape, and it will never be forgotten; there is magic here. It goes out there - beyond.